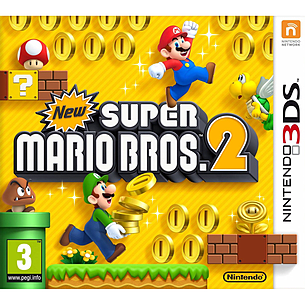 New Super Mario Bros. 2 doesn't deviate greatly from the formula established in past entries in the New Super Mario Bros series on DS and Wii. It's a side-scrolling platform game in which you travel through the Mushroom Kingdom on a quest to rescue Princess Peach from Mario's nemesis Bowser, collecting coins and jumping on enemies as you go. Much of it will feel familiar to anyone who has played one of the older titles, from the themed worlds you explore to the bosses you fight, but you can now collect three large hidden coins in each level to unlock extra ones, and as they're often tucked away in hard-to-reach locations this rewards skill in an otherwise rather easy game. Another new element is the title's increased focus on coin collecting. As ever, amassing 100 grants you an extra life (half-decent players will be swimming in lives by the midway point), but they also act as an overarching high score. The game logs every single coin you collect, even across multiple save files, and lets you compare your total to that of passers-by using the 3DS StreetPass system. The game's coin obsession culminates in a new Coin Rush mode. 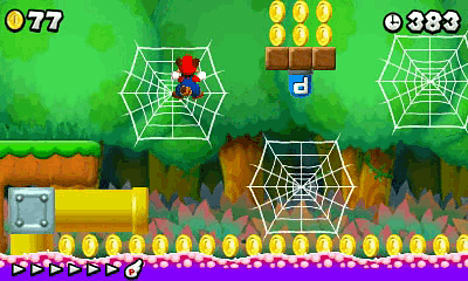 With one life, and against a time limit, you have to collect as many coins as possible across three randomly selected stages taken from the main game. Again, your total number of coins collected will be recorded and compared with fellow players' over StreetPass. 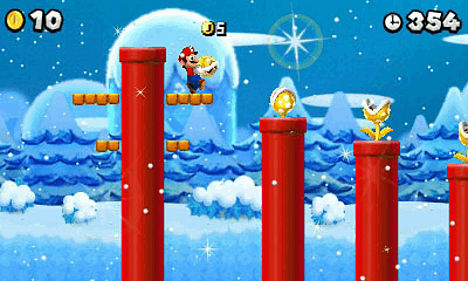 The game features a number of power-ups that give you special abilities, like a powerful golden mushroom that lets you unleash fireballs that turn everything into coins, a brick-hat that sits on Mario's head spewing out coins every second it's still attached, and a flight-capable raccoon suit which enables you to reach airborne platforms full of coins, pull off crafty shortcuts, and whip nearby enemies with its tail. Mushrooms increase your size and power, while invincibility stars make you temporarily invulnerable. The game also offers you a gilded racoon suit with the power of invincibility after you've died a few times in quick succession to make things easier for novices, although it does nothing to help avoid deaths by sheer drop. Perhaps the biggest new addition to the game is a co-operative mode which lets another player with their own copy of the title play alongside you as Mario's brother Luigi. It's a great option to have, although players are required to stay in close proximity to one another (stray too far and you'll be turned into a bubble and sent back to your partner). While this was understandable in New Super Mario Bros' Wii co-op mode, in which players shared a TV screen, it seems unnecessary to limit freedom of movement when each player has their own 3DS. With the last two New Super Mario Bros games having sold over 50 million copies between them, it might be unsurprising that Nintendo's not keen to take many risks with an established formula, but years of being spoilt mean we've come to expect more than straight sequels from Mario games. It's therefore a little disappointing that the series doesn't feel like it has progressed as much as it could have since the original NSMB title hit DS six years ago. But even a lesser Mario game remains an incredible title - it may play things safe, but all that it does it achieves masterfully. The physics and level design are so fine-tuned, and the overall gameplay so responsive and intuitive, that this is the best side-scrolling platformer available on 3DS, and a game that everyone should really play. Co-op is a welcome addition. Could be more adventurous in terms of new ideas. Co-op mode could offer more freedom of movement. Not the most impressive use of 3D.